What’s your freelancing or small biz fancy? Graphic design? Virtual assistance? Accounting? Well, if it’s *not* writing then sitting down to bang out that next blog entry might not be your favorite task. Yet if you’ve decided blogging is a sound strategy for promoting your business and connecting with customers, then you’ll need to get those fingers on the keyboard. You’re blogging, not writing a college thesis. Resist the urge to use 5-syllable words or write sentences worthy of a Russian author. Imagine the ideal person you want to read that blog entry. How would you explain your point, share your tips, or relay that info to that specific person if you were speaking to them in person or on the phone? That’s the language and terminology you’ll use to write a blog entry. No more, no less. Don’t fall for the SQUIRREL. What’s your blog entry about? If you’re a photographer writing about how to coordinate outfits for a family photo shoot, then the article should include tips and tricks pertaining to that and only that. It can be easy to be distracted by a SQUIRREL!, and dive into a discussion of outdoor lighting conditions or add several paragraphs about what time of day is best to take infant pics. Stay focused, freelance-san! Spell check alone does not a blog-ready article make. Editing is about ensuring the entry is easy to read and understand, and–by default–portray yourself as a professional. After all, when a prospect reads an article lousy with mistakes, he or she is bound to ask: If this web designer is so sloppy with her own blog, how sloppy will her work be if I hire her? Ideas are all around you. Really! 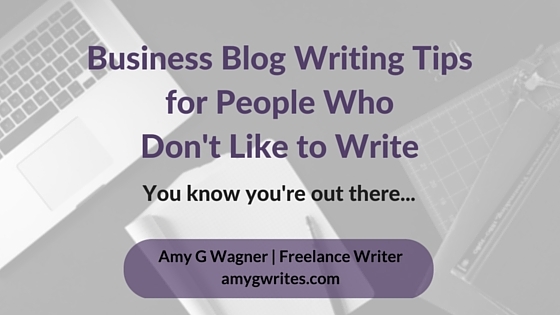 Blog ideas for freelance businesses can come from a conversation with a client or colleague. They can come from problems with your last project or something your 5-year-old says. Remember that tip above about sticking to your topic? Well, those thoughts about outdoor lighting or infant pics would be fantastic ideas for their own blog entries. If you’re not a pro writer, what is it about writing that makes you want to chuck your keyboard?